Alonzo Maciel for Bushwick Daily. 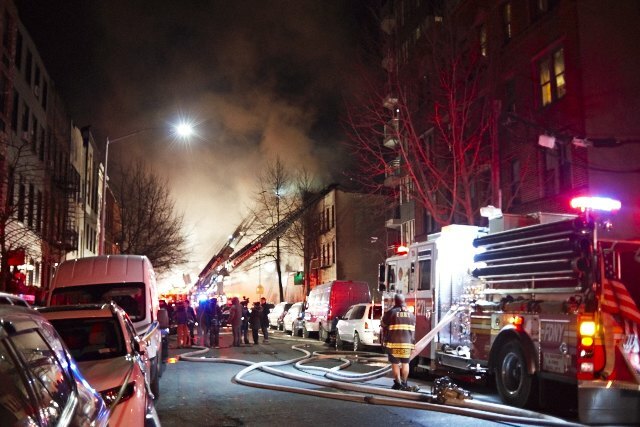 FDNY officials told Bushwick Daily Friday that an investigation into the cause of the massive fire that destroyed five buildings on Bushwick's DeKalb Avenue has been closed, and that it has been determined that it started as an electrical fire in the rear of 1427 DeKalb Ave. According to the FDNY, the accidental fire started among arcing wires in a setback area in the rear of the church in the building. The wires were rumored to be the source of the fire as early as the day after it occurred, but the Fire Department did not confirm this theory before today.